And here are the leaves finished. They will become part of our Autumn Feast Exhibition next Thursday. 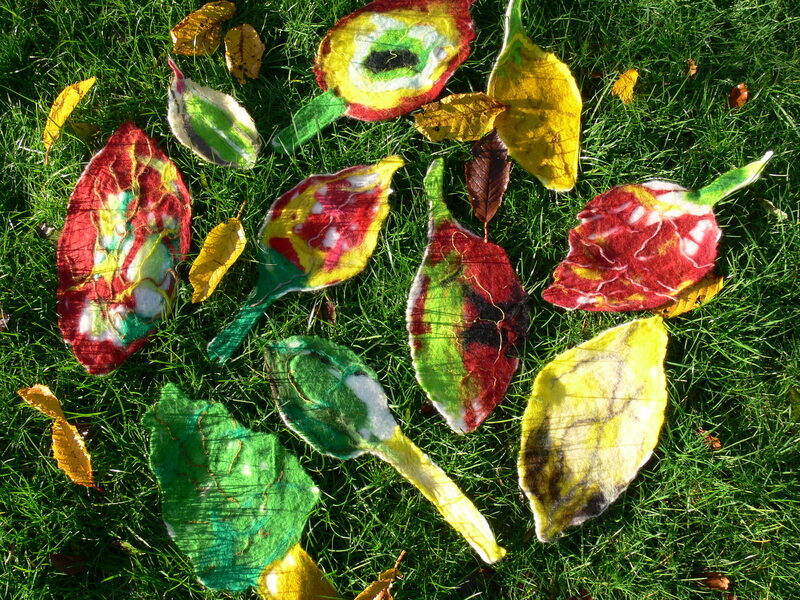 Because the autumn leaves are so perfect this week I brought a selection along to inspire our felt making. The children spent a while observing the leaves and making sketches before starting. A lot of the children had made felt with me before and after trying a various hairstyles and facial hair with the wool roving they got stuck into the activity using coloured fibres, yarns and felt scraps to create some carefully observed and some imaginary leaves. These photos are of the leaves before the rolling process . The children finished the session by making invitations to invite their parents to their feast exhibition next week. 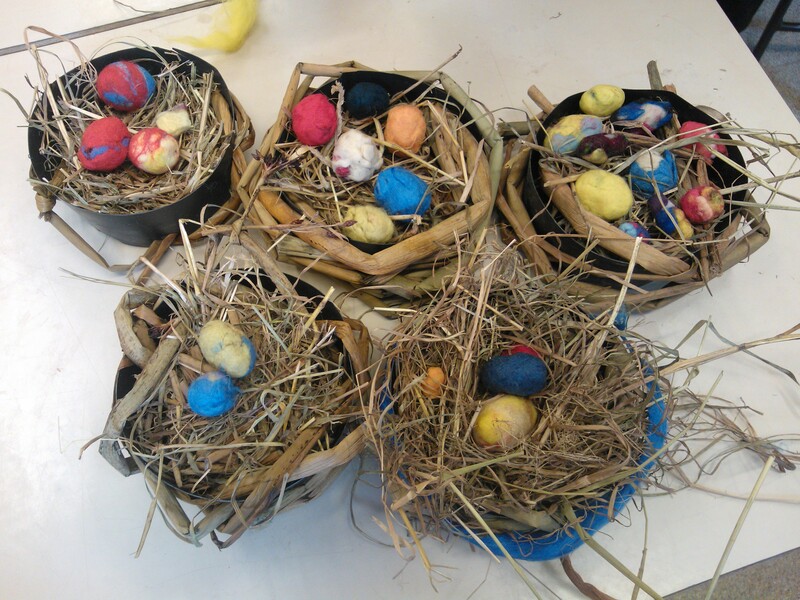 Last art club before Easter and we just couldn’t resist the eggs. Liz brought along some rush for the children to weave into birds’ nests. She buys her rush from a lady in Bedfordshire who goes out to collect it in her boat. 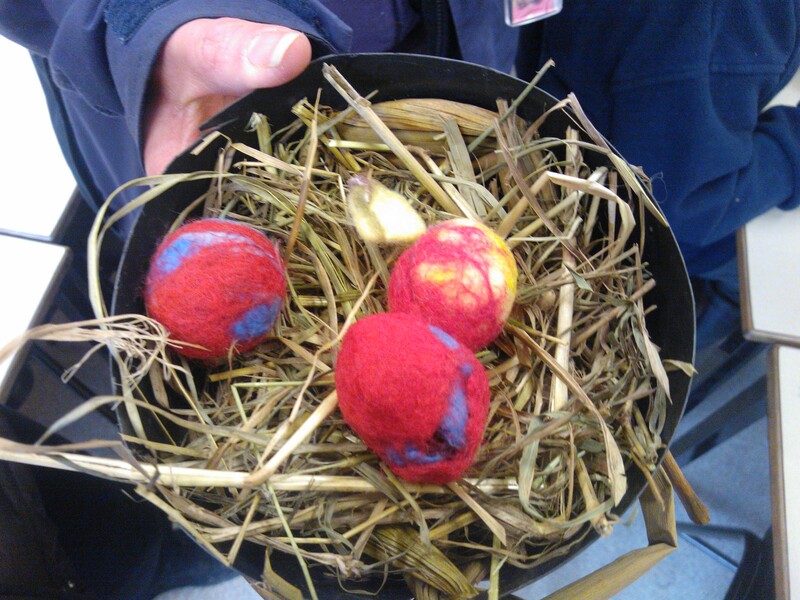 We then showed the children how to used dyed wool fibre to create handmade felt eggs. Quite a few of them had made flat felt with us before and took a while to get used to going 3D. Once they got the hang of it though they quickly filled their nests and I think there were a few attempts at making felt birds as well.